Black is a classic chic color, perfect for that woman who likes to add an air of mystery to herself. It’s also an amazing color for an accessory such as a handbag. If you love wearing black, then don’t miss the opportunity to buy the Saint Laurent Catherine handbag, a wonderful piece of black joy. Catherine is another in the line of amazing Fall/Winter 2018 bags. It is also another masterpiece of minimalist design. As you can see, it comes in a single color, a deep suave black. Perfect for those high-class nights as well as all-night parties. The powerful calfskin makes the bag hard and durable, yet sleek enough to make it feminine and beautiful. It looks so sleek, in fact, that any businesswoman or career gal can carry it and knock the competition dead. The front compartment closes with a stylish flap. Its sides are adorned with two golden hardware pieces, whereas everything else is made of high-quality bronze. Inside, you also have a pocket that closes with a high-quality zipper. The name of the brand is present in tiny letters in the front of Catherine. And that’s not all. This bag also comes with a smaller, removable purse for your coins and cards, with its own flap and snap button. So let’s recap – a smooth black color, a stylish shape, golden and bronze hardware, adjustable strap, one compartment with a zipper, and a removable coin purse. Yes, Catherine is definitely the bag for you, madam. And on top of all that, it’s a durable product that cannot lose its wonderful shape. You can’t afford NOT to have this bag. 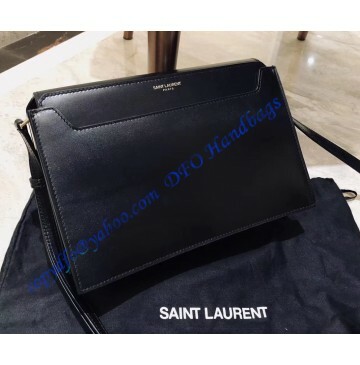 The Saint Laurent Catherine bag is 23 cm (9.1 in) wide, 15 cm (5.9 in) long, and 6 cm (2.4 in) deep. Aside from some golden and bronze hardware, the Catherine is almost entirely black. It is made of durable and hard calfskin. Saint Laurent Catherine can be all yours for $357.